The conflict between Houthi rebels and government forces in Yemen is just another manifestation of the regional rivalry between Saudi Arabia and Iran, which had earlier echoes in Syria and Iraq, say Russian observers. Meanwhile, Russia and the West have yet again found themselves on different sides of the conflict. How likely is a new confrontation between Moscow and the United States over the situation in Yemen? After a coalition led by Saudi Arabia launched air strikes targeting Houthi forces in Yemen, the civil war raging in the country quickly went regional. In fact, according to Russian experts, the conflict, while technically pitting Shiites against Sunnis, was not caused by religious differences, but by the rivalry between Iran and Saudi Arabia, especially since the main reason for the intervention cited by Saudi government were the actions of Iran, accused by the Saudis of supporting the Houthis. Kosach is also convinced that Tehran is simply not interested in participating in any conflict at the moment when the nuclear deal is so close. “Iran will not interfere in the conflict. It is simply impossible both militarily and logistically. All they can do is provide moral support”, he explains. Leonid Isayev, an orientalist at the Moscow Higher School of Economics, also believes that Riyadh is deliberately emphasizing the religious dimensions to the conflict: “To provide grounds for the intervention, Saudi Arabia is picturing this conflict as one between Shiites and Sunnis. But tensions between confessions is not something Yemen is famous for,” he says. According to Isayev, the conflict is actually being stoked by the Saudi authorities, who have no need for a strong, united and therefore uncontrollable Yemen. 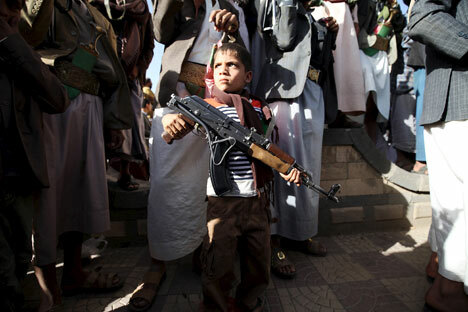 Still, the Yemeni conflict may eventually lead to serious consequences both inside the region and far beyond. The international community does not want another hot spot that will inevitably become a stable source of both armed rebels and refugees for the neighboring countries. “Yemen has always been considered an underdeveloped country to begin with, and its infrastructure, poor as it is, is now being reduced to rubble by the Saudi air strikes,” says Grigory Kosach. Russia has expressed concern about the escalating conflict and is strongly opposed to any intervention, calling for a diplomatic solution. “As in the case of Syria, there is but one motivation: Protect the basic principles of international law,” says Leonid Isayev. “It is about respect for the sovereignty of other countries and non-interference in their internal affairs. Moscow believes it is irresponsible to foment new conflicts in the region.” Thus, he notes, having previously supported Syria and Iran and opposed any attempts to interfere in their affairs, Moscow has once again ended up on the side of the Shiites. Yemen: Syria 2.0 for Russia and the West? Meanwhile, the United States, while taking a rather cautious approach to the Yemeni crisis, has still supported its traditional partner, Saudi Arabia. In other words, Russia and the West are once again supporting opposing sides.